Mostly January was cold and hard, the ground frozen with bits of crust to trip over. Mostly it snowed a good deal in January and we scored at least three snow school holidays. Mostly January found my mom, Tessie, struggling with the idea that spring was still mostly three months away. When I was a kid folks knew winter was coming and they accepted the cold, the snow, the blistering wind, the distant sun hanging in a chilled sky. The men in the village loaded antifreeze into the car radiators and tied a slice of cardboard in front of the radiator so as to keep the cold from chilling down its boil. They backed their cars into the yard and jacked them up to wrap and buckle snow chains around the tires. Some old timers slipped aluminum foil into the bottom of their snow boots for insulation and debated whether shiny side up or down was the best. Women gave up nylons and wore knee high wool stockings under their pants. Folks who didn’t have triple track storm windows sandwiched cardboard between the glass frames and sometimes taped a Sunday Comic sheet to the top window for a little color. All this was done in preparation for the long cold season; but not my mom. No, Tessie refused to make accommodations for the season. She told us that if you prepare for a cold snap you will surely get one. So she never prepared for the cold and the cold came anyway, sometimes with a vengeance. Ricky Cramshaw and I were rolling a giant snowball along Mountain Avenue. It was already as big as we were and getting bigger, which meant getting harder to push. We had packed it down with every new layer of snow it gathered as we rolled the snowball closer and closer to the top of First Street. It was hard to move or even talk it was so cold, and our breath came clouding out and up our faces. We were wrapped in layers of wool, booted and mittened such that our arms and legs were thick and awkward. Our plan was to roll the giant snowball down the First Street hill and have it crash into the thruway fence, but as we neared the top of the hill we gave up. The giant snowball was no longer possible to move. It was too big and too heavy. We stopped, stepped back, and stared at it. After some minutes of exhausted silence Ricky spoke. “Well, that’s that.” And so we walked around it and headed down the hill to my folks house for hot chocolate. My mom Tessie came rolling along Mountain Avenue in her ‘58 Chevrolet Wagon, accompanied by the muffled thumps of her tire chains on the snow-packed road, until she approached the top of First Street where a giant snowball blocked her way. She stopped the car and stared at the massive white ball of winter in the road. She no doubt thought about ramming it but there might be a child on the other side. It was snowing so visibility was not good anyway. She honked her car horn and waited. The snowball did not move. Reluctantly, she opened the car door and got out. 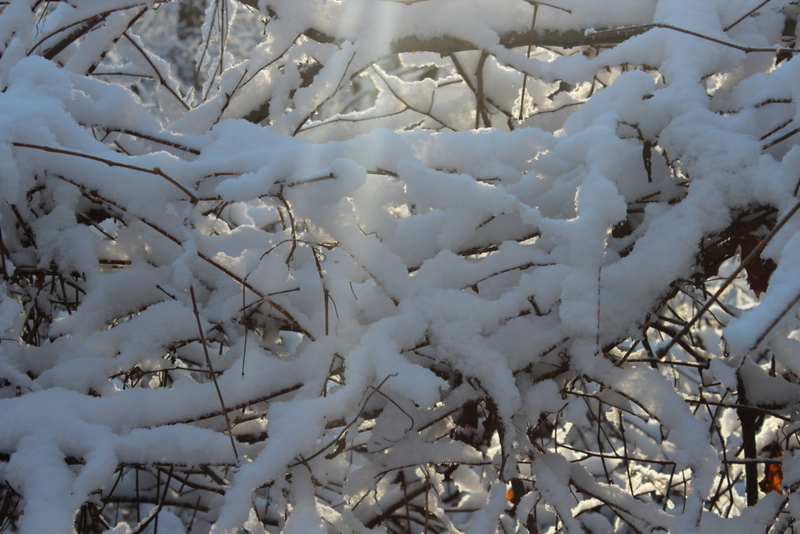 The world outside her car was cold and soft and silent, yet active with big, white snow flakes dropping from above. She stepped up to the giant snowball and touched it. It did not move. She walked around and saw that it was smooth and hard and well packed. 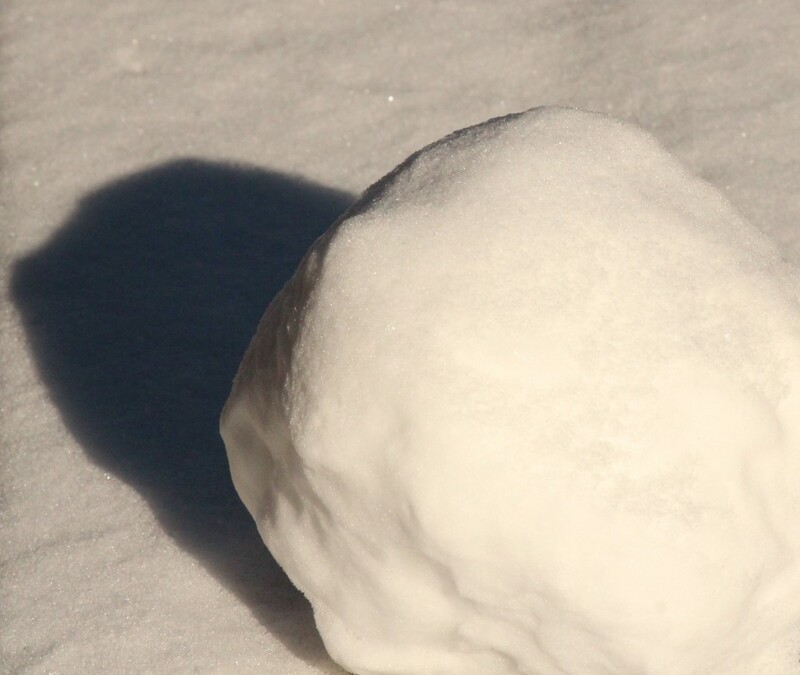 She faced the snowball, and putting both hands against it, pushed as hard as she could – but it did not move. Determined, she got back into her car and crept the ‘58 Chevrolet slowly up to the edge of the giant ball of snow and ice. Her car touched it. She accelerated and nudged the snowball a few inches. Winter would not get the best of her. She pressed her foot down hard. We got up and went to the window and saw out at the bottom of First Street, Tessie sitting up in her ‘58 Chevrolet Station Wagon up against the thruway fence, the front of her car having just skied down the hill with a giant snowball stuck under the wheels. She was trying to back up but the car was stuck with its front end up off the ground. In frustration she honked the horn three times and then three times again.